I liked this book. There, I’ve said it. Was it an epic spy thriller? No, not really? Was it filled with death, destruction and pure homicidal rage? Not really, but for a Stephenie Meyer Book, you could argue that it is. But is it like Twilight? No, definitely not, far from it. And that, I feel, is the problem for many readers. Meyer has made the leap from sci-fi YA to adult thriller, and while she’s no James Patterson or Martina Cole, I don't necessarily see this as a bad thing. Those books do get very clichéd and typical after a while. That said, you do need some patience when reading this book. Like The host, there’s a lot of exposition. Which is needed, Meyer wants the reader to sympathise with a CIA torturer. And I did. I found myself hoping that Alex would survive, I could understand the choices she made, and as I continued to read the book, I began to cheer her on. So, though the start was long and some could argue arduous, it was needed. And yes, it has action. But not constant. There is a section where Alex is hiding, and I can see how this may bore some thrill seekers out there, but to me this just makes the story more believable. She’s not James bond, she needs to regroup once in a while. I can’t hold that against her. Besides, someone on the run and whose whole narrative is “I need to survive” isn’t going to go and ask for trouble out right. And that brings me to the Romance. Oh la la. Is this the “timeless” burning passion of Bella and Edward? No, and again I’m glad because Meyer has been there and done that. Yes, the romance here does fill rushed, and that's an honest criticism, but I still did wonder if the romance would pan out. And what’s more Alex isn’t a damsel in distress! For a writer who highly criticised about the feminist perspective, Alex is a fighter. A fighter who not only challenges male counterparts, but thrives when doing so. So, why can’t she be a fighter and have a little happiness on her own terms too? 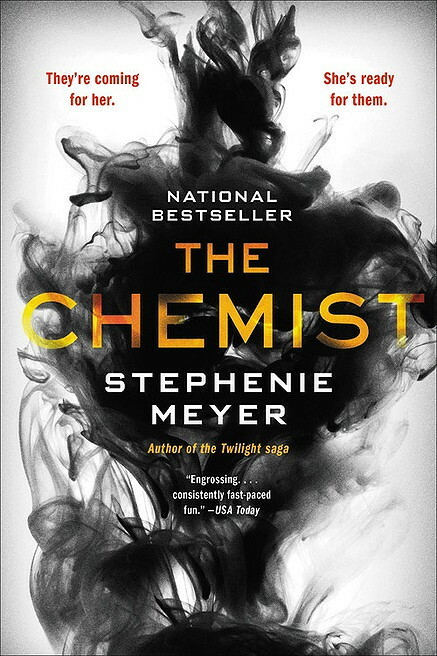 The Chemist isn’t perfect, but for what it is, I repeat, I liked it. If you're a Kathy Reichs fan, this may not be your cup of tea. But it is a well researched narrative, with all the traits a true Meyer fan will love. Give the book your time and effort and you will be rewarded. But if you want a book that you can read in an hour, pick something else. This book needs to be savoured, not choked down in one gulp. Best known for her Twilight series, Stephenie Meyer’s four-book collection has sold over 100 million copies globally in over 50 countries, with translations in 37 different languages. Meyer was the highest-selling author of 2008 and 2009 in the United States, having sold over 29 million books in 2008, and 26.5 million books in 2009. In 2008, Meyer also released The Host, which debuted at #1 on The New York Times and Wall Street Journal bestseller lists. Additionally, USA Today declared Meyer “Author of the Year,” citing that she had done something that no one else had in the 15 years of the USA Today bestselling book list– she swept the top four slots in 2008. Meyer also accomplished this feat in 2009, when The Twilight Saga once again dominated the top of the bestseller list. All together, her books have spent over 303 weeks on the New York Times Bestseller List. No, I have not had the chance to stand up for someone I did not know. Would if I could. Thanks for the chance to win The Chemist! No, I haven't had a chance to stand up for someone I hardly know. "Have you ever stood up for someone you hardly knew?" No, I don't think so. Yes, I do it often, especially online in groups. I find it very difficult to stand back and watch injustice or prejudice without getting involved. That I have, I've been there & can't stand "Haters"